The first-ever complete set of certified proof U.S. $3 gold coins will be publicly displayed for the first time anywhere at the Professional Coin Grading Service (www.PCGS.com) booth, #1101, during the American Numismatic Association’s National Money Show™ in Sacramento, California, March 17 - 19, 2011. “The proof $3 gold is an undervalued series. This is in part due to the extreme rarity of the coins. Many collectors are not attracted to a series where the coins are so difficult to find. For example, many of the dates only have populations of nine or ten. 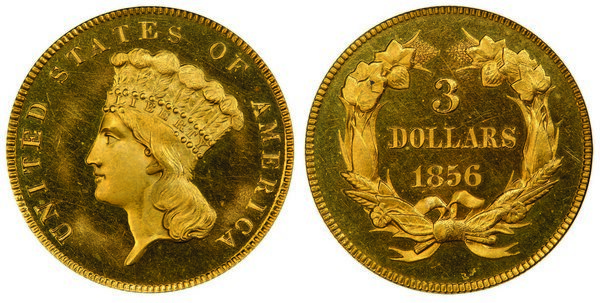 The 1855 and 1856 have a mintage of five each,” said Bender. In addition to the proof $3 gold, his Indian Cents Basic Proof Set is ranked number one in the PCGS Set RegistryTM and his Lincoln Cents Basic Circulation Strike Set is ranked number three. He currently is putting together a complete type set and a complete collection of Liberty Seated dimes. The PCGS Set Registry has more than 54,000 registered sets of U.S. and world coins. For additional information, visit online at www.PCGS.com/setregistry or call PCGS Customer Service at (800) 447-8848.